Getting to that moment was a long, unlikely journey. To again point out the obvious, DuVernay is a black woman, and there aren’t many people like her directing movies of any budget these days, let alone a $20 million studio tentpole about a historical icon that’s opening on Christmas Day. By comparison, her last movie, 2012’s Middle of Nowhere, was an intimate look at the life of a woman waiting for her husband to get out of prison. It cost $200,000. This hundredfold leap is daunting stuff, but it hardly shows. The first time I meet DuVernay, she plops down next to me and starts gabbing in her great raspy voice like we’re old friends. We’re at a decadent ­Paramount-hosted dinner, the existence of which indicates the studio is betting big on the movie. This isn’t even a premiere; it’s a celebration of the first look at five minutes’ worth of semi-finished scenes at New York’s Urbanworld Film Festival. As evidence, he points to “the bizarreness of how I met Ava.” During a 2010 round of fund-raising for Middle of Nowhere, DuVernay’s producing partner reached out to a Canadian friend, who reached out to his Canadian friends, one of whom sat next to Oyelowo on a flight to Vancouver. They struck up a conversation. “David takes the script from a stranger and ends up calling me,” says DuVernay. “He says, ‘My name is David Oyelowo, you may not know me. But I’m an actor. I really loved this script, and I’d love to talk to you about it.’ ” Oyelowo eventually played the part of the bus driver who gives the film’s protagonist a shot at new love. Even after she was offered Selma, she needed convincing. “I wasn’t interested in making a Mississippi Burning through the eyes of a white protagonist,” she says. The film’s original script was by Paul Webb, a white Englishman, and focused more on LBJ’s backroom political efforts to pass the Voting Rights Act. Webb’s effort had landed on the Black List of best unproduced screenplays all the way back in 2007. But DuVernay said she’d take the film only if she could do a rewrite. The producers agreed, and she got the job in March 2013. “My interest was showing people on the ground in Selma,” says DuVernay. “The band of brothers and sisters who were around King.” She wrote new scenes about the battle for control between King’s Southern Christian Leadership Committee and the Student Non-Violent Coordinating Committee, as well as ones highlighting the leaders’ savvy strategy of creating dramatic, newsworthy images. “Someone standing up against a trooper with their hands behind their back,” explains DuVernay, “is a more sympathetic image than someone with a rock in their hand.” Her script has at least two dozen new or newly fleshed out characters, including SNCC co-founder Diane Nash (Tessa Thompson), the gay SCLC leader Bayard Rustin (Ruben Santiago-Hudson), and Coretta Scott King (Carmen Ejogo). 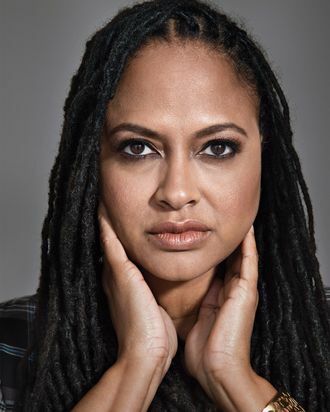 When I left DuVernay in mid-October, she was overseeing a Los Angeles sound studio trying to relocate a little girl’s laugh she knew had gone missing from Selma’s opening scene, which cuts between King receiving the 1964 Nobel Peace Prize and four doomed Alabama black girls in their Sunday best tromping down the steps of Birmingham’s 16th Street Baptist Church on September 15, 1963. “There’s a giggle on the stairs that’s not on the track,” DuVernay told her engineers — and it was essential, she insisted, that we hear that bright burst of joy and life before a Ku Klux Klan–planted bomb rips through the building. DuVernay was up against the clock, but in a far more profound way, her timing is right on. The afternoon of the New York screening, Missouri governor Jay Nixon declared a state of emergency, allowing him to have the National Guard intervene in anticipated protests in reaction to the Ferguson grand-jury decision. It was hard not to think of Selma, 1965. “The current dismantling of the Voting Rights Act and the breaking of the black body at the hands of police, this is not new,” DuVernay pointed out. *This is an extended version of an article that appears in the December 1, 2014 issue of New York Magazine.